If you know… you go. 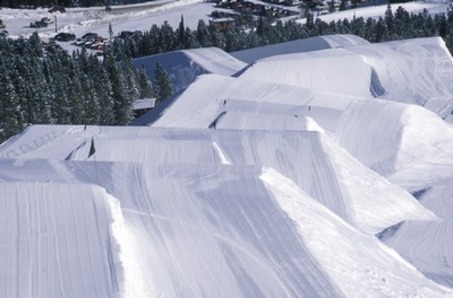 What you might not know is that Freeskier Magazine has ranked the terrain park at Breckenridge #1 in North America. Here is what they have to say, “Ask any of the world’s top park and pipe skiers where to find the best terrain parks, and nine times out of ten they’ll tell you Breckenridge. Complete with four parks, Breckenridge offers jumps, jibs, pipes and bonks for skiers of all abilities. And while Breck’s beginner terrain parks—Bonanza and Trygve’s—are superb, the advanced parks give Breck its No. 1 status in our resort guide, for the third straight year. Located on Peak 8, Park Lane and Freeway combine for a park skier’s paradise. Park Lane, designated “medium” by locals, is littered with jumps ranging from 20 to 45 feet in length and jibs galore. Get as creative as you’d like while picking your line from top-to-bottom; it’d take days before you managed to exhaust the numerous possibilities. The adjacent Freeway is home to Breck’s world-class, 22-foot superpipe, a slew of massive, perfectly sculpted jumps and a handful of burly rail features. If you’re throwing down in Freeway, and you’re not already super spons’d, you should probably be considering a pro skiing career. That’s a pretty big deal – so, as stated earlier, if you know, you go. So… now you know. Not to mention, the Dew Tour makes its’ annual pitstop in Breckenridge this upcoming week, from Thurs, 12/12/2013 to Sun, 12/15/2013. The event brings world class athletes like Shaun White, Louie Vito, Kelly Clark, Bobby Brown and more. This is also the first official US Ski and Snowboard Team Olympic selection event and the first qualifying events for Olympic freeski slopestyle, freeski superpipe and snowboarding slopestyle disciplines. You don’t want to miss the excitement! While you are falling in love with boarding and skiing in Breckenridge, you will also fall in love with the town and never want to leave. If you want a home away from home, the most incredible ski in, ski out accommodations sitting right at the base of Peak 7, from a luxury studio to 4 bedroom condo, you need to get it squared away now. Have you considered fractional real estate ownership? There are so many benefits of owning a second home at a fraction of the cost with absolutely none of the hassle. This entry was posted on December 8, 2013 by elevatemarketingaz. It was filed under Breckenridge Colorado Luxury Condo Sales, Breckenridge Luxury Condo Sales, Breckenridge Real Estate, Breckenridge, CO Real Estate, Breckenridge, Colorado Real Estate, Fractional Ownership Real Estate, Fractional Ownership Real Estate Breckenridge CO, Fractional Real Estate Breckenridge, Fractional Real Estate Breckenridge Colorado, Grand Lodge on Peak 7 Breckenridge, Colorado, Luxury Fractional Real Estate, Luxury Fractional Real Estate Breckenridge CO, Luxury Fractional Real Estate Breckenridge Colorado, Real Estate Breckenridge, Real Estate Breckenridge Colorado, Ski In, Ski Out Luxury Condo Breckenridge Co, Ski In, Ski Out Luxury Condo Breckenridge Colorado, Uncategorized and was tagged with Breckenridge, Breckenridge Colorado, Breckenridge Colorado accomodations, Breckenridge Colorado condos, Breckenridge luxury condo sales, Grand Lodge on Peak 7, ski out real estate breckenridge colorado.